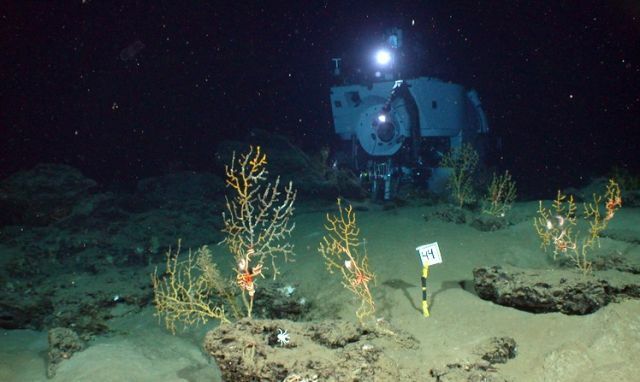 A healthy deep-water coral more than 12 miles (20 km) from BP’s Macondo well, November 2010: Courtesy Chuck Fisher, PSU. Copyright Woods Hole Oceanographic Institution. A study published this week in PNAS finds BP’s oily fingerprints on severely damaged deep-water coral communities in the Gulf of Mexico. The new research also fortifies our understanding that the sheer magnitude of the Deepwater Horizon catastrophe—notably its release at depth—made for a totally different beast than for spills occurring only at the surface. 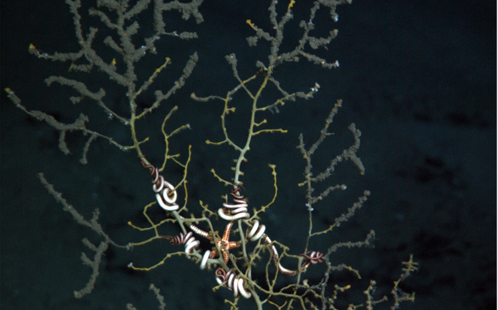 In the photo above you can see a healthy deep-water coral with a healthy brittle star wrapped around it. This photo was taken at a site more than 12 miles (20 km) from BP’s Macondo well seven months after the blowout. Oiled deep-water coral covered with brown wooly material and tissue loss from site 7 miles (11 km) southwest of the Macondo well, November 2010: Courtesy Chuck Fisher, PSU. Copyright Woods Hole Oceanographic Institution. 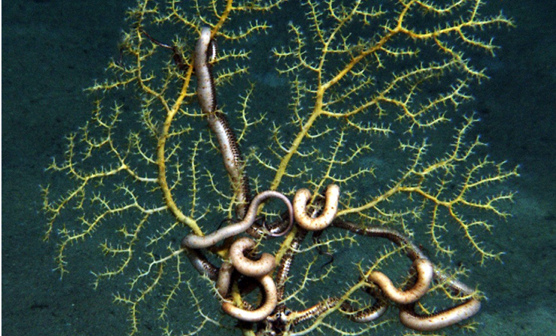 Contrast that with the photo above of a sick, dead, or dying deep-water coral with a sick or dying brittle star attached to it at 4,300-feet deep (1,310 meters), 7 miles (11 km) from BP’s Macondo well seven months after the blowout. So how do you know if it was BP’s oil that was maiming these amazing communities that exist beyond the reach of sunlight? That’s where the interesting science comes in. Using the submersible Alvin, the researchers collected sediments and samples of the corals and filtered the brown wooly material off the sick corals. These materials were then analyzed using comprehensive two-dimensional gas chromatography—a method pioneered at WHOI specifically for use in oil spill research. Alvin collecting sediments and samples of corals for analysis: Courtesy of Chuck Fisher, Pennsylvania State University, and Timothy Shank, WHOI. The results delivered an oily fingerprint traceable directly to BP’s Macondo well spill. What’s not yet known is whether or not these corals and the communities that depend on them will will recover. Members of this research team are monitoring the site, including with time-lapse imaging. I wrote at length about my adventures in the Alvin world in my Mother Jones’ piece Gone.